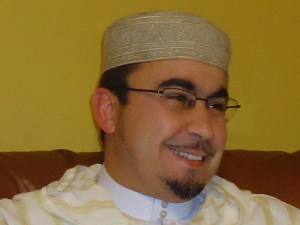 Imam Khalid Shahu was born in Meknes, Morocco, in 1971. He received a B.A. in Arab-Hispanic Linguistics & Literatures from Mohamed Ben Abdullah University, Fez, Morocco, in 1994; he has a M.A. in Arabo-Hispanic Linguistics from Mohamed V University, Rabat, Morocco, in 1995; another M.A. in Philosophy of Language from the Graduate School of the City University of New York (CUNY), NY, in 2011. He also completed his Ph.D. in Sociology of Language, with a concentration on Language Policy & Planning in Post-Colonial North African Countries. Imam Khalid has served as a foreign language instructor, at the High School level (1998-2006); as an Arabic language lecturer at Brooklyn College, NY (2003-2006). Since then, he has been a lecturer of Arabic & Spanish languages and cultures at Durham Technical Community College (2007-2008) and North Carolina Central University (2008-2009). Currently, he serves as a lecturer of Arabic with the Asian Studies Department at UNC-CHAPEL HILL, where he teaches different levels of Arabic language and Culture. In terms of his religious background, he is a student of Imam Abdessalam Yassine, the Founder of the Islamic School of Thought “Justice & Spirituality”. His discipleship to Imam Yassine is what made of him a community leader. Dr. Shahu is one of the main founders of Apex Mosque, for which he served as an Interim Director (2009-2010). Since then, he started acting as the Imam of the Center. During his stay at Apex Mosque, he could launch a variety of community services and projects (i.e. Al-Ihssan School, Al-Manara Preschool, the Cross-Generations Quran School, the Voyage program). Inspired by the teachings of Imam Yassine, Dr. Shahu hopes to make the Muslim Community in the Triangle Area spiritually oriented, well-organized, closely united and civically engaged in the American Society. On the scholarly level, he is working on two main projects, which he conceives as contributing to the building of such a spiritual and well-balanced Muslim Community, which can serve as a role model not only in the Triangle Area, but also in the US.